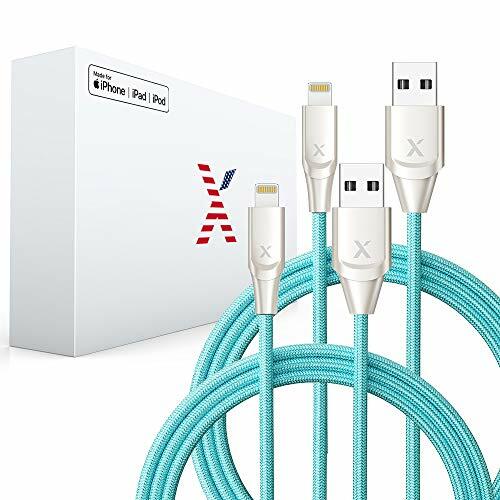 Hurry on over to Amazon where, for a limited time, you can grab this Xcentz iPhone Charger 6ft – 2 Pack for ONLY $17.99 when you use the code: XCENTZXX5 at checkout. Reg price is $29.99 for the 2 cords. ✔MFi CERTIFIED BY APPLE: Our MFi certified lightning cable fully compatible with iPhone, iPod and iPad devices. Fixed not compatible error and last 2 YEARS longer than other cables. ✔INCREDIBLE STRENGTH: Bulletproof fiber Nylon Braided is 5 times stronger than steel which can apply for bulletproof vests that mean this cable can withstand over 30, 000 bends and hold up to 175 pounds (80 KG). ✔PREMIUM DESIGN: Designed in California, fancy looking makes this item look high end. Zinc alloy connectors and durable nylon braided to improve durability and reduce fraying. Best option to purchasing more of these cables for yourself and as gifts. ✔LIFETIME : We provide lifetime for this lightning cable, feel free for your purchase. Contact us at any time and we will reply you with a satisfied solution within 24 hours. How to get this deal: GO HERE and add the item to your cart. At checkout, add the code listed above. Shipping is FREE with Prime!